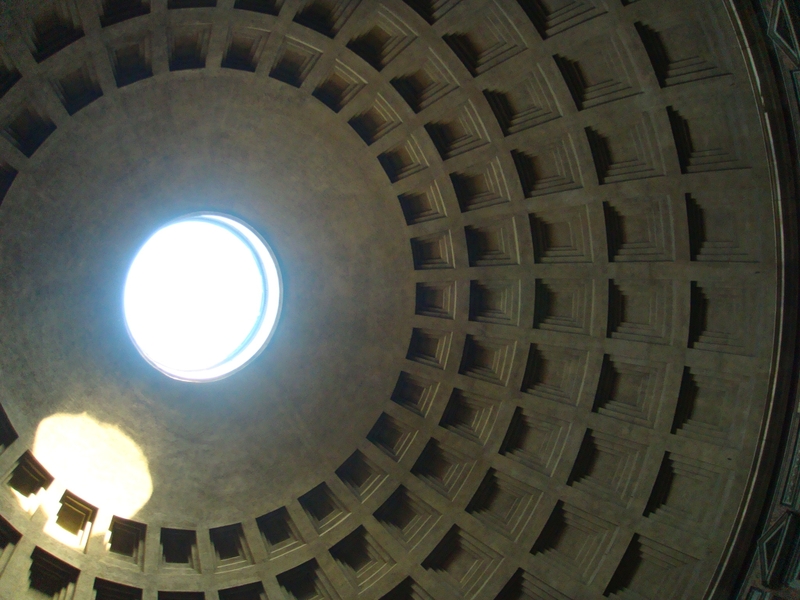 Who built Rome’s Historic Pantheon? 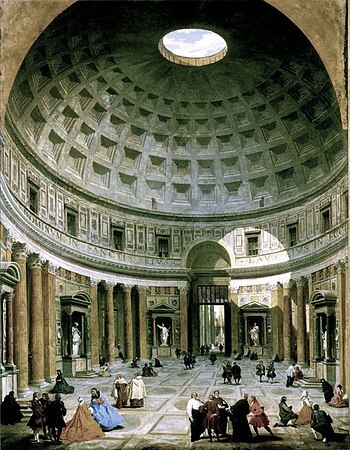 The Pantheon in Rome has occupied its present location for nearly 2000 years. 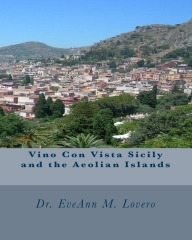 It was originally designed in 27 B.C. 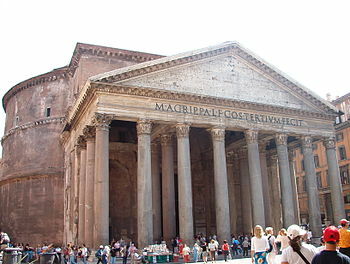 as a pagan temple for all twelve Roman deities; supernatural and immortal beings. 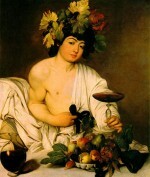 The deities were Apollo, Ceres, Diana, Juno, Jupiter, Mars, Mercury, Minerva, Neptune, Venus, Vesta and Vulcan. [/caption]The massive original doors are still used for entry into the Basilica. The structure is as wide as it is tall (140 x 140 feet). The 30 foot wide oculus in the roof is the only source of light and was designed to allow the smoke from the burning of sacrificed animals to escape. 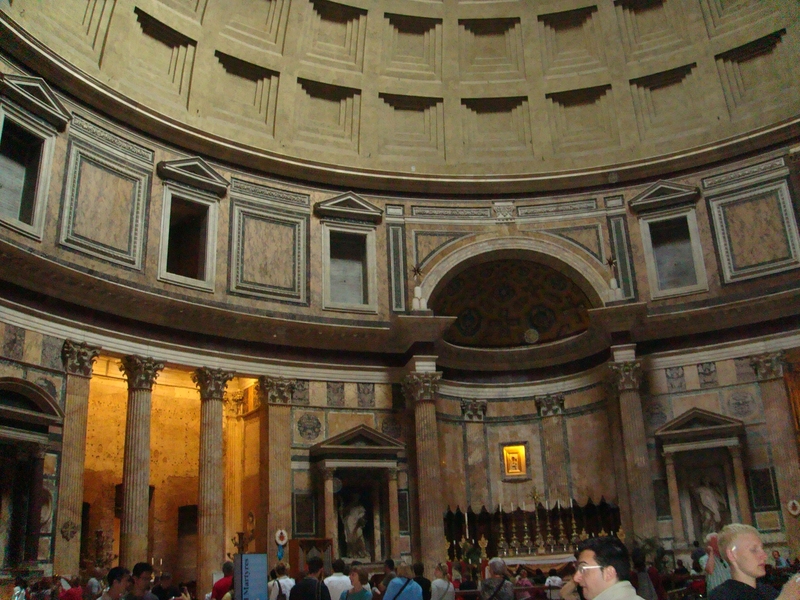 The hemispherical dome was made from un-reinforced concrete and is still the largest dome in the world of its type. [/caption]The coffers for the concrete dome were poured in molds. 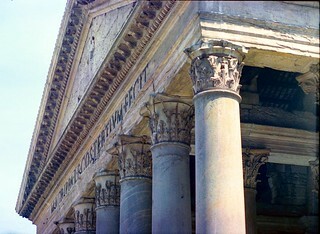 Eight massive granite columns support the triangular tympanon. 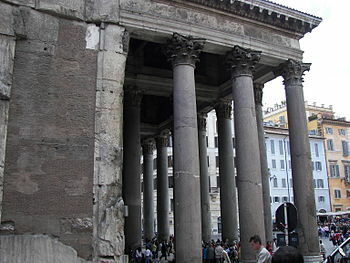 [/caption]Agrippa did not really build the Pantheon; he built an earlier temple on this site in 27 B.C. that was ravaged by a fire. 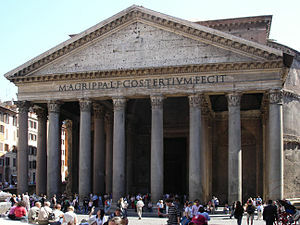 The Pantheon was built in 125 AD during the reign of Emperor Hadrian. 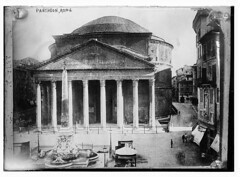 [/caption]The Pantheon was given to Pope Boniface IV in 609 and he converted it into a church and named it Santa Maria ad Martyres. 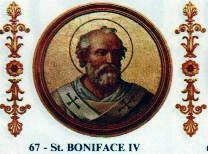 Pope Boniface had 28 carloads of martyrs’ bones brought here from various cemeteries in Rome. 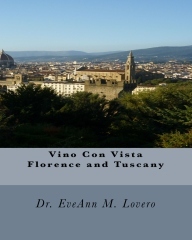 It became the first pagan temple to be consecrated as a church. 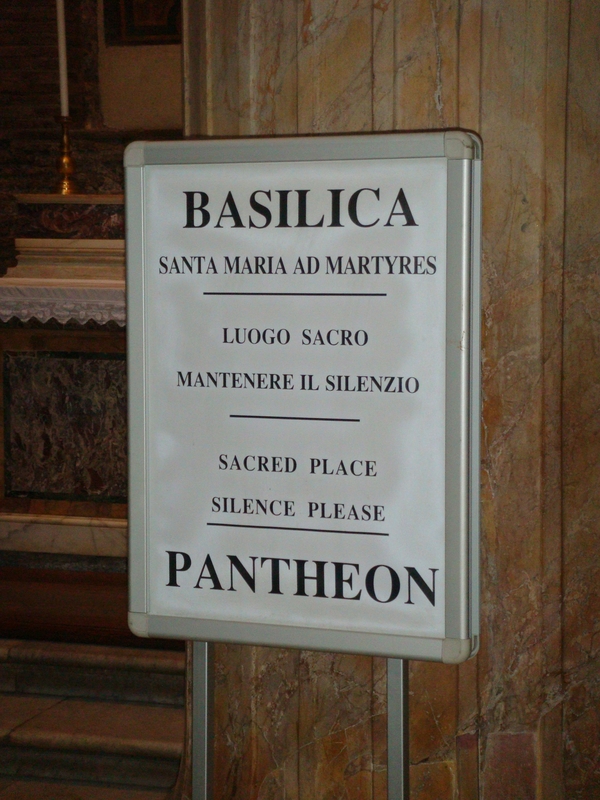 Saint Mary and the Martyrs houses the mortal remains of Raphael in an ancient marble sarcophagus. 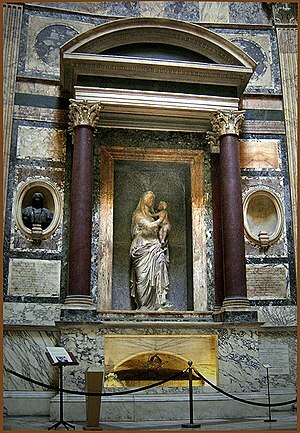 Raphael died in 1520. 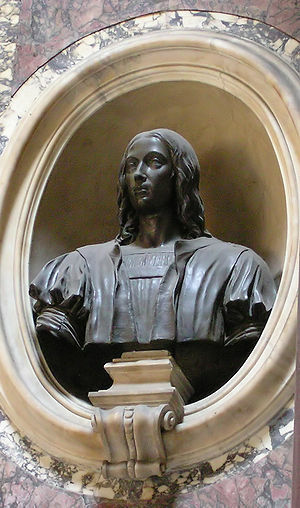 The bust of Raphael located in the niche left of the aedicule and was completed in 1833 by Giueseppe Fabris. 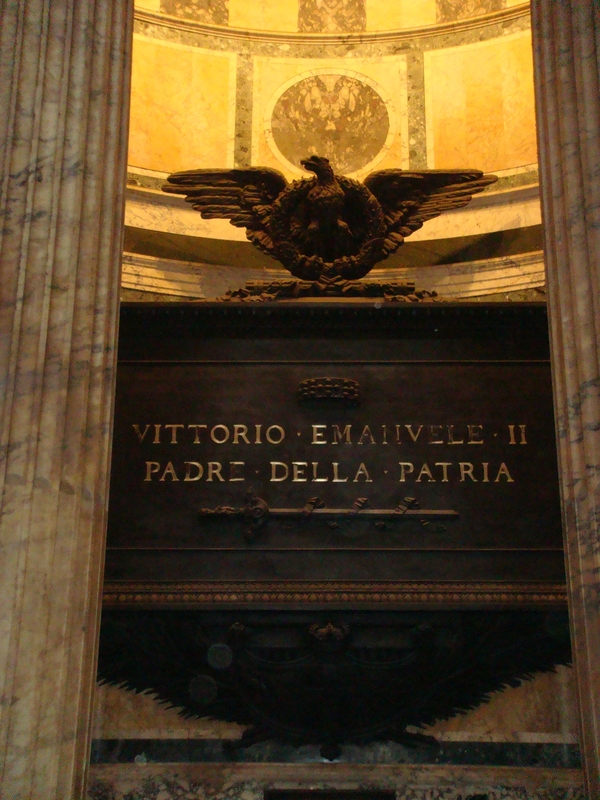 The tomb of the fist king of Italy, King Victor Emanuele II (1820-1878), has a statue of St. Ann and the Virgin in the aedicule to the left of the tomb by Lorenzo Ottoni. 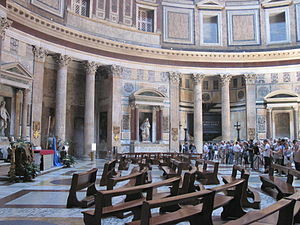 [/caption]Most of the marble was recycled for St. Peter’s Basilica. 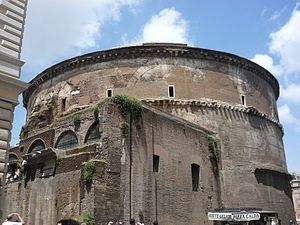 In 1625, Pope Urban VIII (Barberini) removed the bronze from the beams of the portico to make 80 cannons for Castel Sant’Angelo and the four spiral columns of Bernini’s Baldachinno in St. Peter’s Basilica. 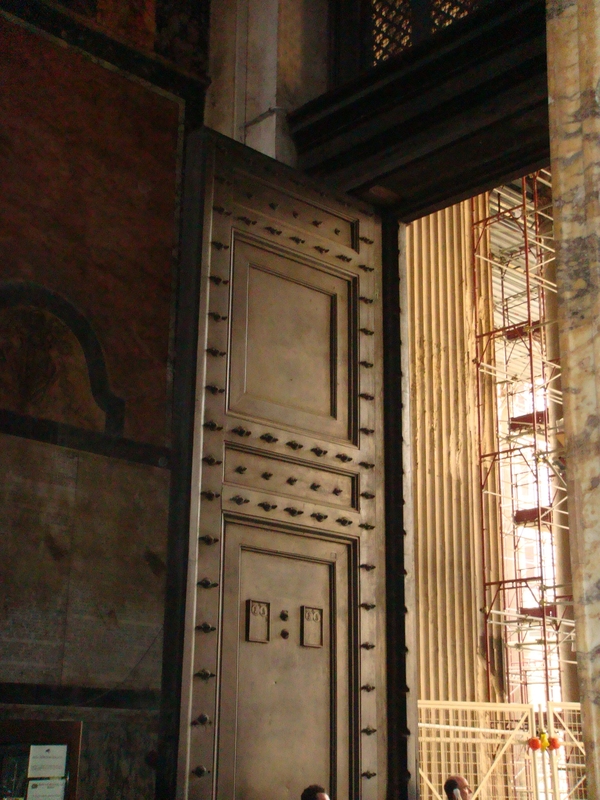 The colossal bronze doors are original. 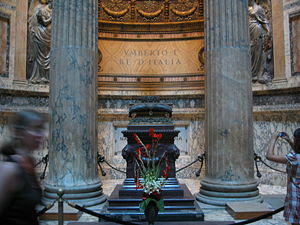 Today we might consider that a “green” ecologically friendly move but the Roman’s say, “Whatever the barbarians didn’t do, the Barberini did.” The tomb of Victor Emanuele II was then created from bronze that was recast from the Castel Sant’Angelo’s cannons at the turn of the 20th century. 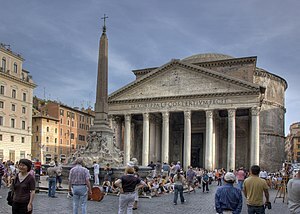 The general area around the Pantheon is the financial and political hub of the city and includes the stock exchange and Parliament. 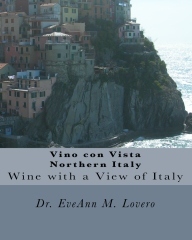 I think the Cafe Agrippa is a great place for a “Vino con Vista”! 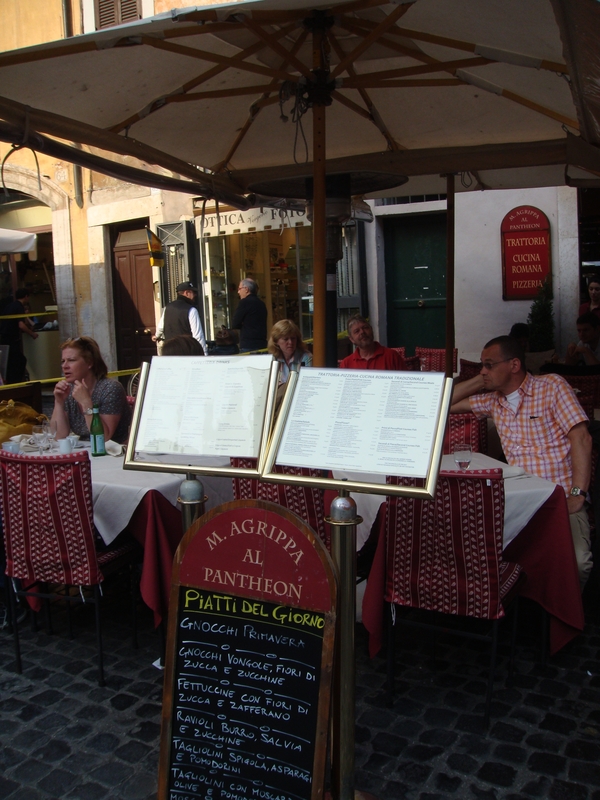 The Piazza della Rotunda is the name of the square in front of the Pantheon. 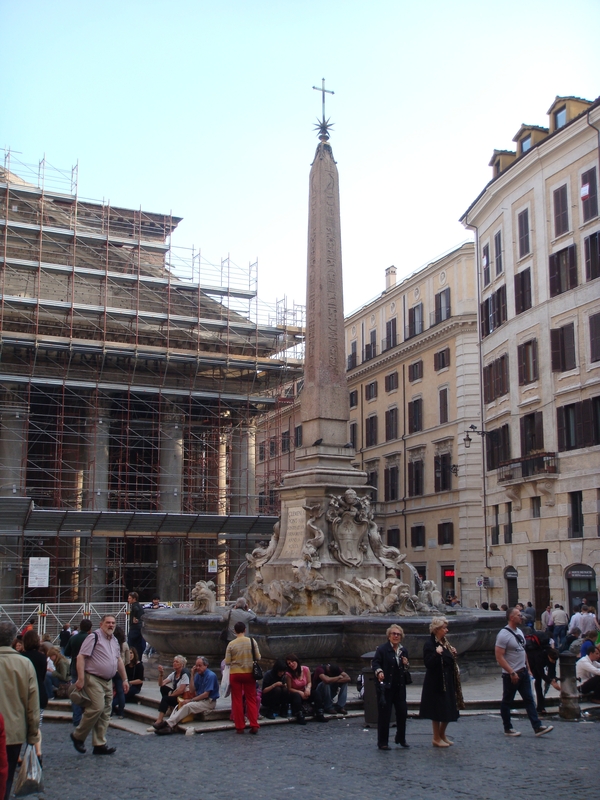 One of Rome’s prized Egyptian obelisks occupies the center of the square. 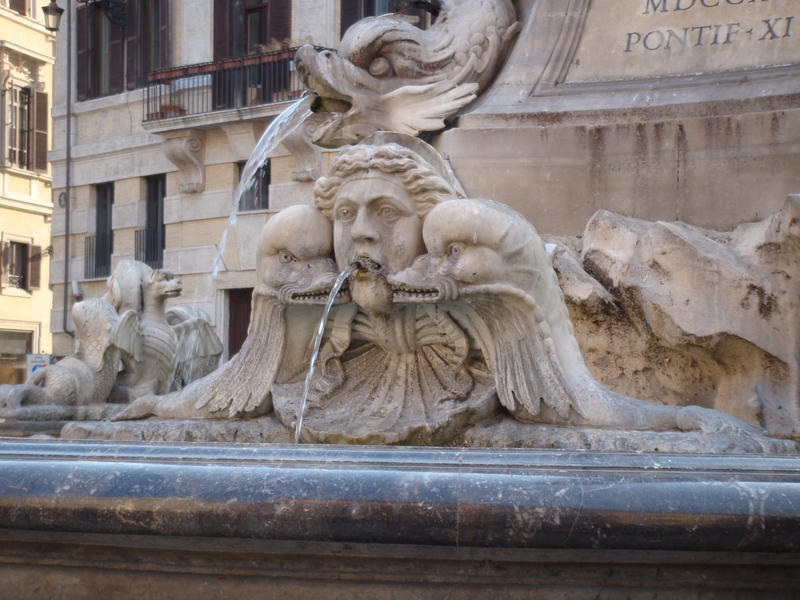 Did you know that you will never get lost in Rome if you follow the obelisks? 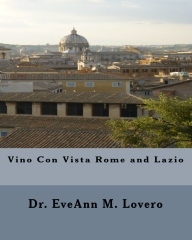 They are like a Roman GPS system that mark important landmarks in Rome. 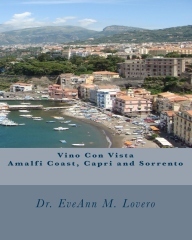 Dr. EveAnn Lovero writes Travel Guides to Italy and Vino Con Vista Travel Guides can be purchased at these sites. 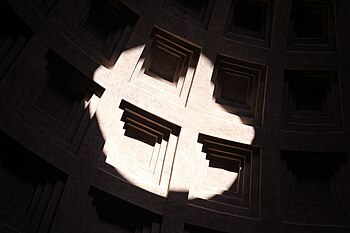 Is Rome’s Pantheon a Giant Sundial? 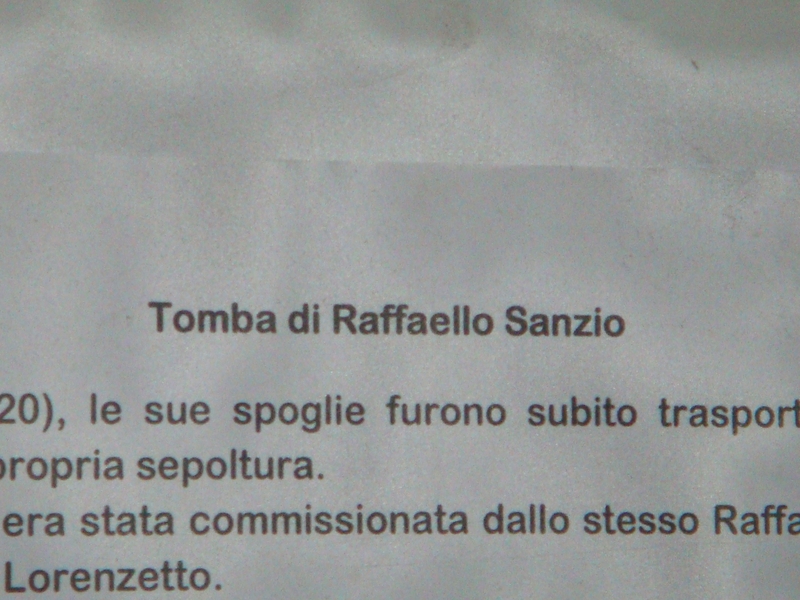 Part of speech: verb Example sentence:Siete gentilmente pregati di riferire eventuali malfunzionamenti dell'apparecchio. Sentence meaning: You are kindly requested to report any possible malfunctioning of the device.